Natures Aid Comfrey Oil is manufactured by extracting the goodness from the finest quality comfrey root and comfrey herb. This is achieved by slowly infusing the comfrey in a soothing natural oil. Sunflower Oil, Comfrey Root, Comfrey Leaf, Propyl Gallate, Chlorophyll. Apply undiluted to the affected area. Gently massage into the skin. 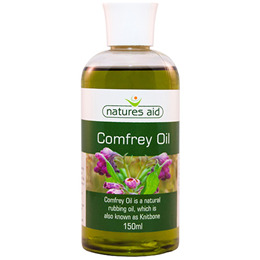 Below are reviews of Natures Aid Comfrey Oil - Natural Rubbing Oil - 150ml by bodykind customers. If you have tried this product we'd love to hear what you think so please leave a review. A friend broke her wrist badly and had an operation to have a plate inserted - resulting in quite a long scar. I bought her the comfrey oil to rub on after the plaster had been removed. She says that it was very soothing and the scar has almost disappeared. I combine some Natures Aid Comfrey Oil Natural Rubbing Oil with other healing, moisturising, and essential oils ~ all mixed in a large bottle which I put in a jug of hot water before my shower, and shake well before applying. It is my all over body moisturiser. The Comfrey Oil is also good to use on its own for tired muscles after exercise or gardening. This is a great value, very versatile, Oil.